The APD was dispatched to Park Junior High School at 4:47 a.m. and again at 5:05 a.m. and 5:57 a.m. in reference to a threat. What the threat entailed has not yet been released. Cmdr. Lindell Smith of the APD called it “very general” in nature and said the department dispatched officers to all APS schools to actively pursue information. Smith said while officers found no evidence anyone intended to carry out the threat, a “very active investigation” is still underway into how the threat was initially spread via social media and who was behind it. APS officials said students not attending classes today will not be counted as absent and that all scheduled activities, including tonight’s district basketball game, will go on as planned. Several parents told the Daily Press this morning they were not notified in advance of the incident and were instead informed at the schools as they attempted to drop off their students. Others said they received word via the district’s text message notification system that school was on a two-hour delay and would begin at 10:10 a.m. 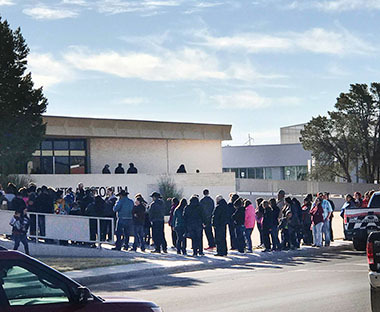 Bus students already collected at the time were taken to the Artesia High School Auditorium, where parents had the option of picking them up. Superintendent Dr. Crit Caton said he was notified early this morning by the authorities that a post made via the Remind.com app was found containing information regarding a possible threat. Caton said the APS issued a news “blast” via the APS app. As buses had already begun their routes when the decision to delay classes was made, they were diverted to the auditorium, at which time a second “blast” was issued notifying parents of that action and informing them they could pick up their students there if desired. Caton said the APS’ telephone messaging alert system was not used, as the district felt it could reach more people faster via the mobile app. Several individuals took to social media following the incident to comment that some schools in the district have not conducted active-shooter drills or spoken to students regarding procedures were such an event to occur. Caton said APS policies require principals to hold an active-shooter drill once per semester. “If they are not following them, they will be,” he said. Caton also urged parents to download the APS app and ensure notifications are enabled in the settings, as well as to speak with their students regarding their actions on social media. “I would like to stress to the parents that during these times, they sit down with their child and talk to them about the seriousness of posting something online in regards to school shootings or anything of this nature,” said Caton. “Because regardless of whether it’s credible or not, it’s going to be investigated, and when that happens and they are found out, there are going to be suspensions involved. Additional information will be reported as it becomes available.